When a person gains celebrity status and seems to constantly be under the magnifying glass for the amusement of the rest of the world, their physical imperfections (or perception of) may be magnified as well. Often what anybody perceives is an imperfection, isn’t really noticed by those around them, but unfortunately, today’s media is not afraid to judge a person’s physical beauty. For these reasons, celebrities sometimes decide to take their hard earned money and use it to change physical attributes they do not like, so in comes the plastic surgeon. Sure, a nose tweak here and there or a little extra boost in the chest might be barely noticeable or do nothing but boost a person’s confidence, which is the point, right? However, some celebrities go a little too far.. 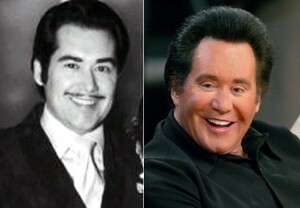 Known best for his country music, Mr. Wayne Newton was a pretty normal, good looking man when he first decided to go under the knife. Post-surgery, his cheeks seemed a little too firm and his face showed no wrinkles, but looks tight. A facelift and some Botox will do this to you, maybe a brow lift too? Mr. Newton’s nose seems to be a bit narrower as well, but this could be chalked up to natural aging.